When Ellie first started her voyage into eating purées, the hardest thing for me to figure out was what to feed her for every meal. I knew the purees I made her were both tasty and nutritious, but I tended to serve her the same purées I knew she loved over and over again. She became bored. I became bored. Plus I was missing a chance to maximize every bite she ate. It was time to add in more nutrients, flavors and colors to her diet. It was time to get organized and start making meal plans for her, which made my type A-personality shine bright. Having a go-to plan of what she was eating, along with all of her foods already made, saved me time and money during the busy week. It also was helpful when she was at daycare, with her grandparents or my husband was watching her, because they all knew exactly what to feed her. I got so addicted to the ease and convenience of having a plan each day for her meals that I started to adapted it to our family meals as well. I still continue to plan all of our family meals and Ellie’s school lunches (check out @babyfoode for more details). 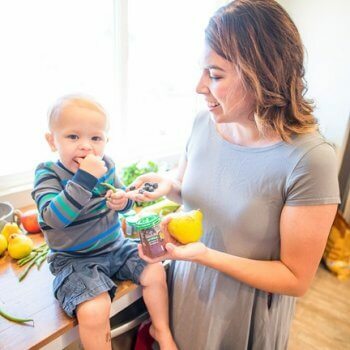 What I have realize over the years of planning puree baby meal plans, is that it doesn’t take that much time or brainpower (sleep deprived parents rejoice) to plan a weeks worth of healthy meals for your little one. Using my tips below, it can take less than 10 minutes per week to come up with a meal plan for your baby. Color, Color, Color! You don’t need a degree in nutrition to make sure your baby is getting all the nutrients she needs. All you need to do is vary the color of food that she is eating as each different color of food is loaded with different nutrients – orange foods are naturally full of beta-carotene, green foods are full of vitamin K and folic acid while red foods are high in vitamin C. With Beech-Nuts easy to see through jars, seeing the bright colorful food is a snap and this step is easy for you to achieve. Aim towards 3-4 different colors a day. Add in Healthy Fats, Protein & Carbs Besides fruits and vegetables, babies need healthy fats, protein and complex carbs in their diets. Healthy fats such as avocado, full-fat Greek yogurt, and good quality olive oil, help with their brain and bone development. Protein helps with muscle strength and repair (especially great for when they start crawling and walking) and can be found in cooked egg yolks, full-fat Greek yogurt and pureed or chopped meat such as chicken, fish or beef. As bad of a wrap as ‘carbs’ get, babies need unprocessed complex carbs such as quinoa, oats, barley and millet to help baby’s digestion, brain growth and they also keep their tummies full. 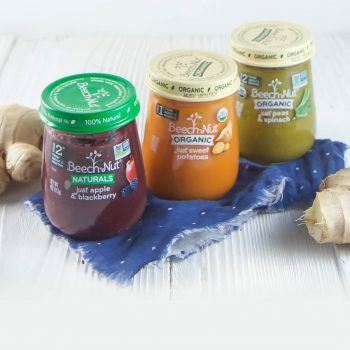 Variety is Key Serving different purees and flavors to baby each day will help them become used to (and crave) different flavors and help them stockpile different nutrients in their bodies. I also found from experience that babies, just like adults, become easily bored with the same taste of food if served every day, so vary it up and keep them entertained with new tastes and textures every meal. 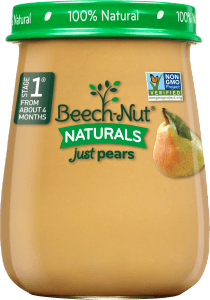 For the month of July, I made it easy for you and have come up with a full 5-day meal plan using my favorite summer flavor Beech-Nut products, whole grains, plain full-fat Greek yogurt, spices and a selection of easy to make finger foods. Now all you need to do is shop, serve and relax! 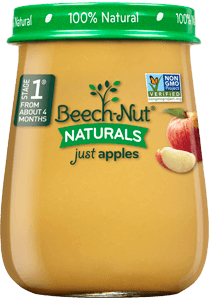 This meal plan is aimed for babies in the Stage 2-3 range, and includes a mix of smooth purees, chunky purees and finger foods. If you baby isn’t ready for chunky purees, no problem. You can puree any of the chunky stage 3 foods, or whole grains with the recommended puree in a blender or food processor for a smooth puree. 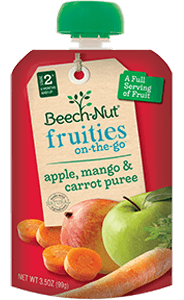 All of the Baby Cereals from Beech-Nut can be served to any age. If your baby isn’t ready for finger foods, no problem. You can either just smash these foods with a back of a spoon until smooth or omit altogether. 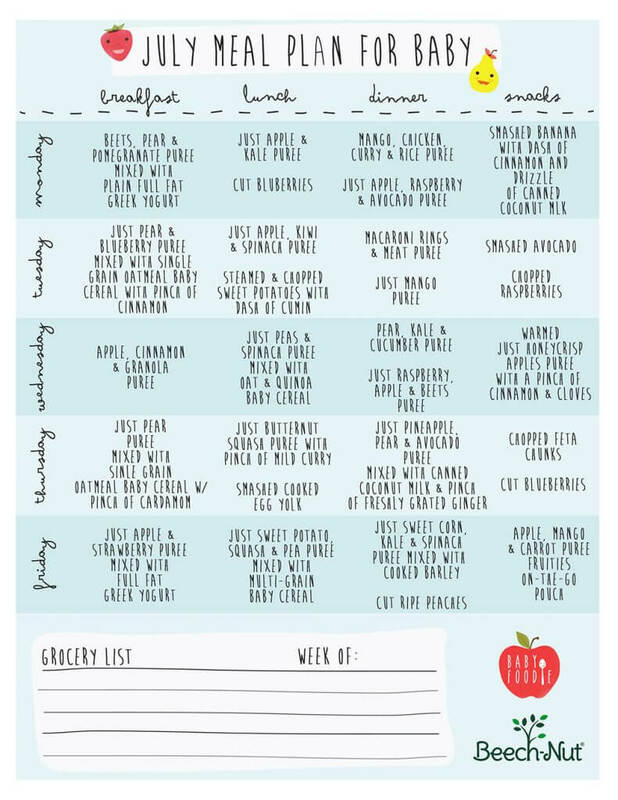 I made the July Meal Plan into a handy downloadable file, so you download, print and post on your fridge for your convenience! Here is also a blank one for you to use. 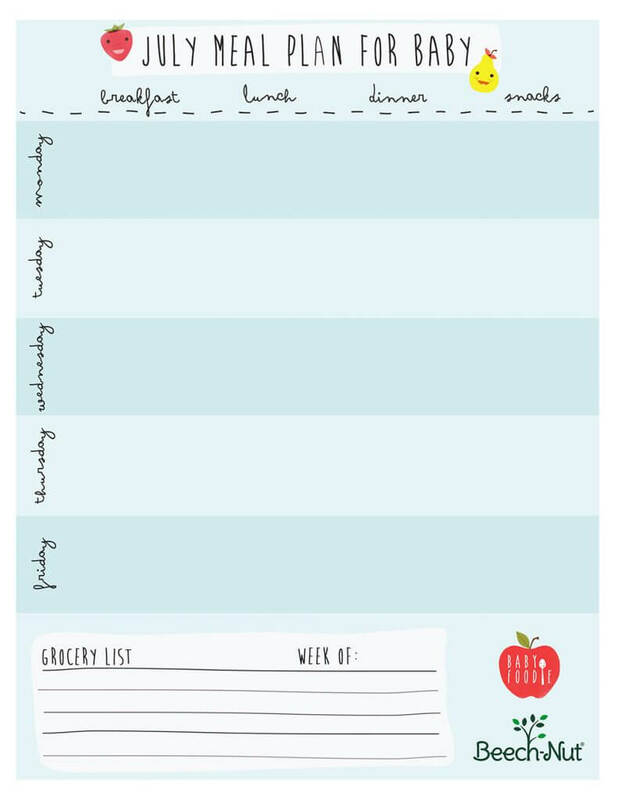 Fill it out with your weekly meal plan, snap a picture, and tag us at @beechnutfoods and @babyfoode! We love to see all of your creative and healthy meals!